Spiritual reﬂections, poetry, and guided practices to transform turmoil and confusion into peace and presence. There is harmony at the heart of everything in existence. Yet so many of us live from day to day with a lingering feeling of inner discord—a sense that something is not quite right that we may not even be able to explain. How do we return to the essential harmony at the core of our being? 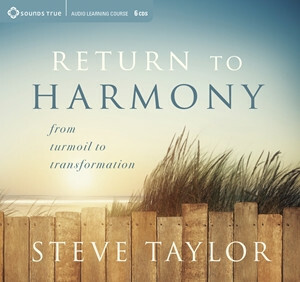 Return to Harmony is a six-session audio course with psychologist and poet Steve Taylor to guide us back home to our fundamental state of peace and presence. From time to time, we all have experiences when restlessness and discontent fade away and we’re filled with a sense of life’s inherent goodness. According to Steve Taylor, this expansive state is not an aberration—it’s our natural way of being when we free ourselves from the inner turmoil created by our minds. This is the process of spiritual awakening—the recognition of who we are in our deepest nature, and the journey of living in alignment with life in the timeless present moment. Return to Harmony weaves together over six hours of original poetry, including many unpublished poems, insightful teachings, and guided practices to help you navigate your own transformational path through some of the challenges that life—and spiritual awakening itself—can bring. “The return to harmony is a journey from disconnection to connection, from separation to union,” explains Steve Taylor. “Along the way, our lives become the expression of something greater than themselves—of an evolutionary energy that flows through us all.” Join this inspiring teacher as your friend and guide with Return to Harmony.